A criminal inquiry into the Volkswagen emissions scandal is looking at "fewer than 10" possible culprits, according to a report. A spokesman for the prosecutors' office in Germany said "more than two, but a lot fewer than 10" staff were being targeted, the AFP news agency said. The comment followed reports this week that up to 30 people may be involved. 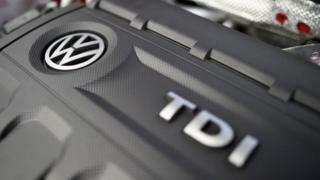 VW has recalled millions of cars after the discovery of engine software that could cheat diesel emissions tests. Klaus Ziehe, the spokesman for prosecutors in Braunschweig, northern Germany, told reporters that state police were putting together a group of about 20 investigators to work on the case. Mr Ziehe said: "We're talking terabytes, not gigabytes [of data], and certainly many cartons of paper." German prosecutors launched their investigation into the scandal last week after receiving about a dozen criminal complaints from citizens and one from VW itself. Martin Winterkorn was forced to resign as VW chief executive over the scandal, and four staff have been suspended. Earlier this week, the weekly German magazine Der Spiegel reported that "at least 30 people" were involved in the deception. But VW dismissed the number as "completely without basis". Some European countries have suspended the sale of Volkswagen diesel models that contain the cheating software, pending a fix from the company. German authorities have ordered a recall of all VW cars fitted with the software, affecting all 8.5 million diesel cars across the EU. The company says a fix could stretch through 2016. In addition to the German criminal probe, and investigations by authorities in countries across the world, VW is conducting its own internal investigation and has hired a US law firm to help. Separately, VW announced on Friday that it had recruited a Daimler executive and former judge Christine Hohmann-Dennhardt as board member for Integrity and Legal Affairs. She will start the job on 1 January.